We are a professionally managed firm catering to all your home furnishing needs since 1979. Delite International manufacturers exporters suppliers and wholesale distributers of premium quality home furnishing items including cotton cushion cover, bed cover, diwan set, Table cover, decorative traditional wall pieces, freeze cover and various types of fabrics..
As the name implies Adarsh Textile is, a leading manufacturer exporter and supplier of home furnishing items from gujarat, established to appease your diveres and ever - expanding home furnishing needs optimally, at highly competative reasonable costs. 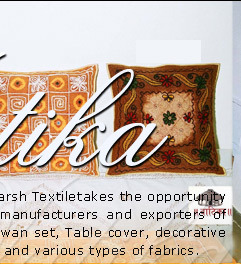 Our company is one of the leading creative companies of India engaged in the manufacture and export of cotton cushion cover, bed cover, diwan set, Table cover, decorative traditional wall pieces, freeze cover and various types of fabrics. 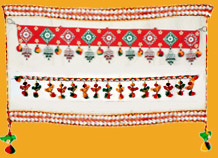 Our all home furnishing and decorative items are famous and popular for the elegant and exclusive selection of cloth materials, designs, innovations, artistry, colour and combination of colours, finishing, etc., and are available in traditional and conventional Indian and western fashions to contemporary and maverick styles and fashions. These facts have given us the prominence and privilege which are not easily accessible to a company that existed merely two decades ago. Our home furnishing products have established themselves by the virtue of their designs and quality. 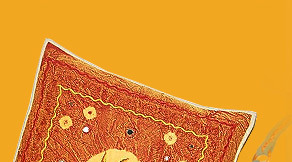 we are specialised manufacturer exporter and online wholesale supplier in stone wash hand embroidery, patch work, arri work, block print, bandhani, saburi, tie and die, batic, mirror, rajasthani hand work, vegetable die and print, discharge print, rapid print, hand printing, wet die, zari arri work, woolen arri work,card work, jogi, figure patch work, diamond stone work and many more. Our company is now fully-fledged to soar high in the sky of home furnishing & fashion and deal with enw challenges in this field, because of being well-equiped with erudite and experienced professionals, diverse machinery utilizing the latest technology, huge ancillary staff, ingenious innovation, leegant expertise and mellowing experience. 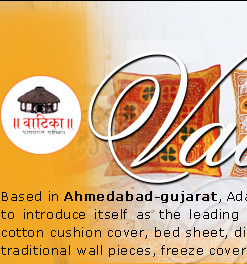 As the name implies Adarsh Textile is, a leading manufacturer exporter and supplier of home furnishing items from gujarat, established to appease your diveres and ever - expanding home furnishing needs optimally, at highly competative reasonable costs. Our company is one of the leading creative companies of India engaged in the manufacture and export of cotton cushion cover, bed cover, diwan set, Table cover, decorative traditional wall pieces, freeze cover and various types of fabrics.we are specialised manufacturer exporter and online wholesale supplier in stone wash hand embroidery, patch work, arri work, block print, bandhan etc. Quality is the lifeblood of our home furnishing and decorative items, and the backbone of our extensive business. The quality and durability of our clothing, fastness of colours, aesthetic designs, elegant artistry, and stricking novelty, etc. have been the focal points of our visionary company since its inception in 1979. Home.. Profile.. Products.. Infrastructure.. Quality.. Contact Us.. Query..